You are here: Home » Tag "Detox"
Don’t forget yourself when you’re planning your holiday gift list! This is your chance to join us for our January 15-Day Mini-Detox. Purchase your Nutri Clear Plus detox kit by January 12th and pay $145 instead of the usual $169…AND receive an invitation to our exclusive January PNW Detox Seminar! 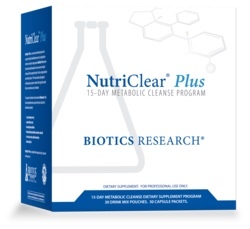 The 15-Day Detox Kit – includes 30 pouches of NutriClear® Plus powder, 30 NutriClear® Plus supplement packets, which include 5 capsules supplying the active constituents from Bromelain Plus CLA™, Beta-TCP™, Livotrit Plus®, BioProtect™, and MCS-2™, as well as 1 Shaker Cup, and 1 Guidebook. Also, those who attend the detox seminar will be offered an additional discount on the purchase of a second detox kit which can be used to extend the detox beyond the 15 days or given as a gift to a friend or family member! Tell us you want to purchase the kit and attend the event by emailing frontdesk@purenwell.com or calling 844-787-3935, Ext. 1! Invite a friend to sign up with you; we’ll see you there!! Then, jump-start your wellness with our January 15 – Day Mini-Detox. Purchase your Nutri Clear Plus detox kit by January 12th and pay $145 instead of the usual $169…AND receive an invitation to our exclusive January PNW Detox Seminar! The 15 Day Detox Kit – includes 30 pouches of NutriClear® Plus powder, 30 NutriClear® Plus supplement packets, which include 5 capsules supplying the active constituents from Bromelain Plus CLA™, Beta-TCP™, Livotrit Plus®, BioProtect™, and MCS-2™, as well as 1 Shaker Cup, and 1 Guidebook. Will you join us? Let us know you want to purchase the kit and attend the event by emailing frontdesk@purenwell.com or calling 844-787-3935, Ext. 1! Can’t wait to see you there!! Join us for our January 15 – Day Mini-Detox. Purchase your Nutri Clear Plus detox kit by January 12th and pay $145 instead of the usual $169…AND receive an invitation to our exclusive January PNW Detox Seminar! supplement packets, which include 5 capsules supplying the active constituents from Bromelain Plus CLA™, Beta-TCP™, Livotrit Plus®, BioProtect™, and MCS-2™, as well as 1 Shaker Cup, and 1 Guidebook. Are you coming? Let us know you want to purchase the kit and attend the event by emailing frontdesk@purenwell.com or calling 844-787-3935, Ext. 1! Can’t wait to see you there!! Have you ever read the ingredients list on your deodorant? If so, you may have seen things like parabens, propylene glycol, aluminum, and several other ingredients you can’t pronounce. Some of these are known hormone disruptors, carcinogens, and neurotoxins. As mentioned in my previous post about natural skincare, these ingredients and products are not required to be tested for safety. It’s up to us as consumers to do our research and make informed decisions about the products we want to put on our bodies. Often times, the ingredients in deodorants are what leads to pit stains. Using a natural deodorant without those nasty chemicals will help you avoid those unsightly and hard to clean pit stains. Detoxing is a very hot topic these days. There are detox diets which include a plethora of juices, smoothies, shakes, soups, tonics, teas, and salads. These detox “diets” promise quick fixes for just about anything. But is it really the best way to detox? Detoxing is your body’s natural process of flushing out toxins and eliminating other waste. The body does this through urine, feces, sweat and even through your breath. Even if you don’t put concerted effort into detoxing, your body will still do it. However, the body’s detox organs- the skin, lungs, kidneys, liver, and colon- sometimes get bogged down by a poor diet, and need a little help. That’s where “doing a detox” can come into play. Better energy – no more afternoon slump! You’ll be feeling so great, you’ll ditch that afternoon coffee. Imagine being able to play with your kids, or go for that walk like you’ve been wanting to do! Healthier sleep patterns – fall asleep easier, stay asleep longer, and just feel more rested. Sleep is vital to our health. It’s the time our bodies repair and rejuvenate, so when you’re sleeping less, your body isn’t at its full potential. We’ll help you get the restorative sleep you need to feel your best. Increased cognitive ability – no more brain fog! You’ll be able to stop apologizing for forgetting things, and your mind will be a lot sharper.